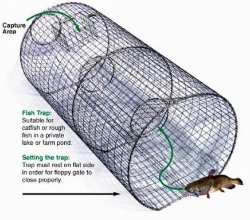 Baiting the trap:Bait can be place in bait box as provided. Types of Bait: Any type of catfish bait placed in a cheesecloth or pantyhose to contain bait, or a can of dog food with holes punched in the ends. Setting the trap: Trap must rest on flat side in order for floppy gate to close properly. Size: 20" x 20" x 54"